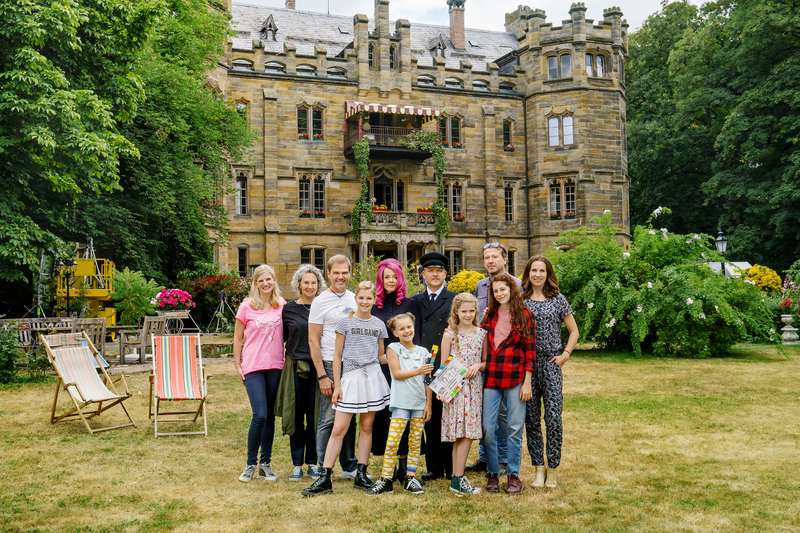 SH Berlin | The family comedy THE SPRITE SISTERS, co-produced by STORY HOUSE Productions, is currently shooting in Bavaria. The movie will be released in German cinemas in winter 2019/2020. THE SPRITE SISTERS is based on Sheridan Winn’s bestselling girls’ book series of the same name, which has inspired many fans worldwide with its magical stories about the sisters Flame, Sky, Flora and Marina. The film is directed by Sven Unterwaldt (“Help, I Shrunk My Teacher”). Katja Riemann (Glenda), Anna Thalbach (Mrs. Duggery), Justus von Dohnányi (Oswald), Gregor Bloéb (Dad), Doris Schretzmayer (Mom) and the newcomers Laila Padotzke (Flame), Leonore von Berg (Sky), Lilith Julie Johna (Flora) and Hedda Erlebach (Marina) play the leading roles in this magical cinematic adventure. THE SPRITE SISTERS is produced by blue eyes Fiction, in co-production with Dor Film Produktionsgesellschaft, Filmvergnuegen, Potemkino, Buena Vista International, Pixomondo and STORY HOUSE Productions. Sky can’t believe it! When she wakes up on the morning of her ninth birthday and moves her fingers, her cuddly toys start flying. Her older sisters Flame, Flora, and Marina are not surpised: they also developed magical abilities on their ninth birthday. When Flame, the oldest of the four, shows them a secret room in the basemant with a strange compass rose in it, something magical happens. The four sisters touch the compass rose and glittering elves dust flies through the room. Sky is thrilled and does not see why she should hide her powers from others. But Flame is determined to keep their powers a secret – not even their parents know! Meanwhile, dark sorceress Glenda sets off for Cantrip Towers, the hometown of the sisters. She has felt the reawakened power of the compass rose, to which she is connected by a dark secret, and now claims its magical powers for herself. Glenda tries to drive a wedge between the sisters. Now Sky, Flame, Flora, and Marina really have to get it together – otherwise Cantrip Towers is in great danger! * Group Picture (v. l. n. r.): Production Executive Maike Haas (The Walt Disney Company Germany), Produzentin Corinna Mehner (blue eyes Fiction), Regisseur Sven Unterwaldt, die Darsteller Hedda Erlebach (Marina), Katja Riemann (Glenda), Leonore von Berg (Sky), Justus von Dohnányi (Oswald), Lilith Julie Johna (Flora), Laila Padotzke (Flame), Kameramann Marcus Kanter und Schauspielerin Doris Schretzmayer (Mother).